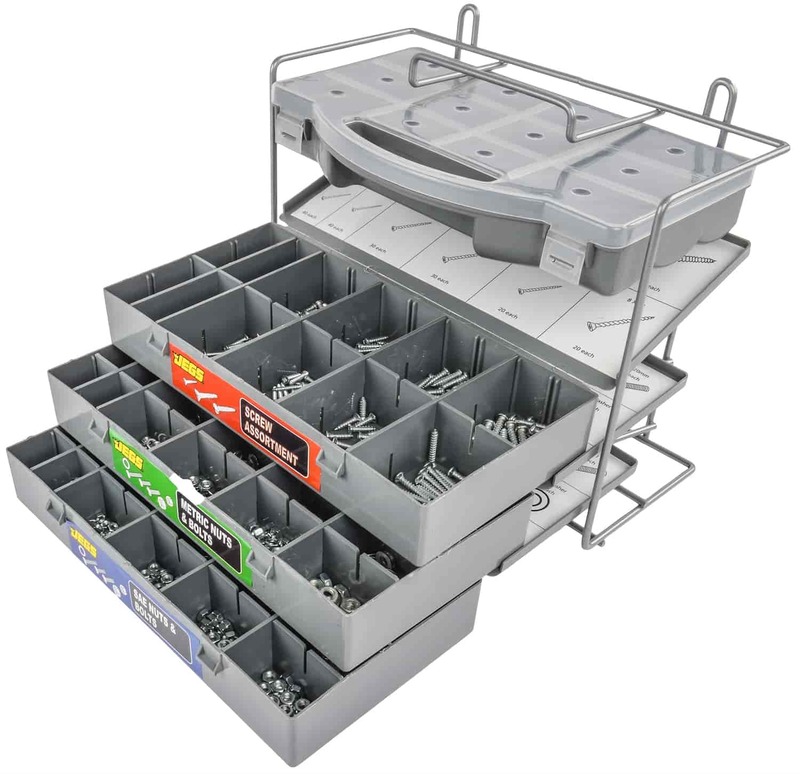 JEGS 1200-piece fastener kit provides you with an assortment of wood, sheet metal, machine, and hex head set screws; along with nuts, bolts, and washers. Twelve hundred pieces of top quality hardware, organized in labeled hardware cases; all you could want to suit a number of different tasks around the shop or home. 84200 is rated 3.3 out of 5 by 17. Rated 5 out of 5 by Doc Hemi from Can't beat the price! The over all size of this set makes a nice small organized set in my car trailer. The Tray for the plastic boxes makes it easy to mount on front wall of trailer for easy access. I added a small strap to hold in the trays. My trailer is a multi-use trailer. Drag car, show cars, Jr. Dragster, and off road side by sides. Can't seem to ever have enough parts and pieces. The top box now hold Zues buttons and after modifying it just a little an extra attaching tool for buttons. Rated 5 out of 5 by Daveb62 from As advertised! Used this product the same day it came to my house! Rated 5 out of 5 by Peglegwillie from Great nut and bolt carrier Bought this to help with containing spare nuts and bolts even better than shows. Added more to it different sizes and works great. Easy to find exactly what you need !!! Rated 5 out of 5 by Presto pending divorce from Adequate I took a chance and ordered this despite the number of bad reviews. Yes, they are screws and not bolts. Yes, the quality is not automotive grade. No, they didn't arrive all mix together (they have since added a thin sheet of foam in the lid to keep the parts in the bins) If you value your time and get tired of running to the store every time you start a project because you need a small metric threaded screw to complete, this would be am ideal purchase. I've had now for over a month and have counted at least 3 occasions where I needed a screw and found it in this kit. I feel confident that it will pay for itself in short order. Rated 3 out of 5 by Devin 69z from Decent for small project stuff , the plastic lid latches are terrible, the rack is handy . Rated 3 out of 5 by TIMMIE from Not as big as I thought I thought it would be larger..but it's okay for the price. Rated 2 out of 5 by KerryG from No Quality Assurance For Sure I purchased this primarily for the rack and cabinets so I could reload it with better quality square drive wood screws and small machine screws. Unfortunately, the only thing of any quality in this set is the metal rack. Only one latch on each cabinet will latch due to poor quality of construction. When it arrived, most of the contents were in the box due to this issue. I didn't expect much for the price but was hoping for a bit more quality. What grade are the bolts, nuts, and washers? This bolt, nuts , screws &amp; washers are not graded. JEGS 80715 - Bolt & Nut Gauge Dimensions: 8-5/8" x 3-1/4"